During my show on SiriusXM Fantasy Sports Radio over the years, I've said many times that you have to wait for at least three weeks of the regular season to get a pretty good idea on trends and situations for daily fantasy football betting. Well, that certainly is the case this season, as I believe we have a pretty good idea now where situations are headed at this point and some of the surprises for the first few weeks have settled into more stable situations. And with that being the case, it's off to Week 4! The eighth-year signal caller has gotten off to one of his best starts of his career, with eight touchdown passes along with 860 yards in just three games. One of the biggest reasons why Dalton has improved is because he's working with an improved group of passing targets. With TE Tyler Eifert relatively healthy this season and with the emergence of third-year WR Tyler Boyd, teams can no longer just double-team veteran TE A.J. Green and believe they can shut down the Bengals passing game. 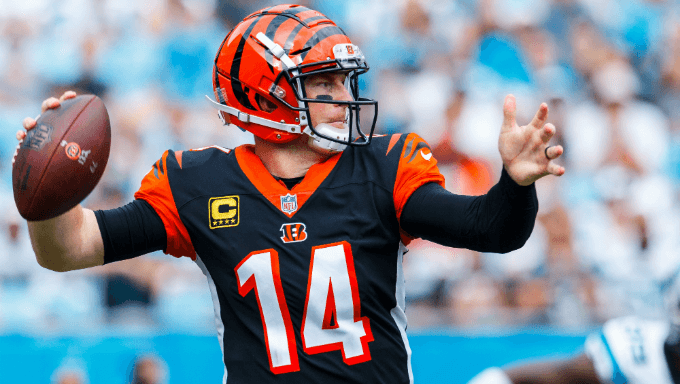 Dalton will face a Falcons defense this week that's without both starting safeties, so that really bodes well for him, along with the Bengals passing game on Sunday. Here's a player that most people don't hear a lot about, yet he has been one of the top fantasy running backs over the past two seasons. And the fifth-year pro is off to an impressive start this season, as he's averaging over 5 receptions per game and has posted 4 total TDs. With the 49ers likely struggling to move the football after losing two starters on offense (QB Jimmy Garoppolo, RB Jerick McKinnon) for the season, the Chargers offense should possess the ball for a majority of the game, so Gordon could be in store for his best game to date through his first four weeks of the season. While the Raiders are only giving up 93.3 yards per game, they are giving up nearly five yards per carry (4.91). Teams have largely decided that the way to beat the Raiders defense is to throw against them. However, don't look for the Browns to take such an aggressive approach with their passing game. Browns running backs are averaging a total of 27 carries per game, and with rookie QB Baker Mayfield making his first start, look for Hyde, who is coming off of a very solid game (98 yards rushing, 2 TDs) last week, to have a very productive game this Sunday. There's been some panic from those fantasy owners in season-long leagues. And I certainly understand the concern, as the fifth-year pro has yet to score a touchdown through his first three games and is averaging a career-low 11.3 yards per catch. But there's hope around the corner. Beckham will face a defense that has given up a whopping nine touchdowns, 843 yards and 48 receptions to opposing receivers in just three games. And not surprisingly, the Saints defense is ranked worst overall against the receiver position. Because this should be a high-scoring game, there's no reason to think that Beckham won't finally have his breakout game of the season. It would be shocking if he didn't score in this game and doesn't post over 100 yards receiving. I knew when I saw Golladay in training camp for a few days this past summer, it became increasingly obvious to anyone who watched him that he was going to be a breakout star this season. He had the prototypical size that teams coveted, so it was surprising that he slipped to the third round of last year's NFL Draft. My understanding is the main reason why he wasn't draft earlier had largely to do with the competition in the Mid-American Conference. And now the second-year wide receiver has taken a great offseason of work and put together a great start to this season, averaging over six receptions and over 85 yards per game. Sure, he faces an improved Cowboys secondary, but Golladay, who has played in 90.1 percent of the offensive snaps so far, has been very difficult to cover and he is very competitive. Look for him to continue his success this week. While Burton has gotten off to a relatively slow start with only nine receptions through his first three games with the Bears, the fifth-year pro will face a Buccaneers defense that has struggled mightily against opposing tight ends. The Buccaneers, who are ranked worst in the against opposing tight ends in terms of production, have given up the most receptions (25) and most yards (329) to the position thus far. And the Buccaneers are now without starting S Chris Conte, who was placed on injured reserve this week. So, if you're looking for a reasonably priced tight end this week, Burton is worth a shot.